Curtains and blinds used in a space can transform it completely.Curtains play a vital role in a space via their texture,fabrics,styles,colors and patterns. A cased heading is used for nets and light weight fabrics.The casing sewn across the top is left open at the ends.They are hung in a slender curtain rod.They are good for less frequently used spaces. They are more formal than rod pocket curtains.One of the best thing about these curtains is that they work with most of the fabrics. There are five types of pinch pleating Curtains-two finger pinch,three finger pinch,four finger pinch and so.More the number of pleats more is the fabric used and more is the cost. 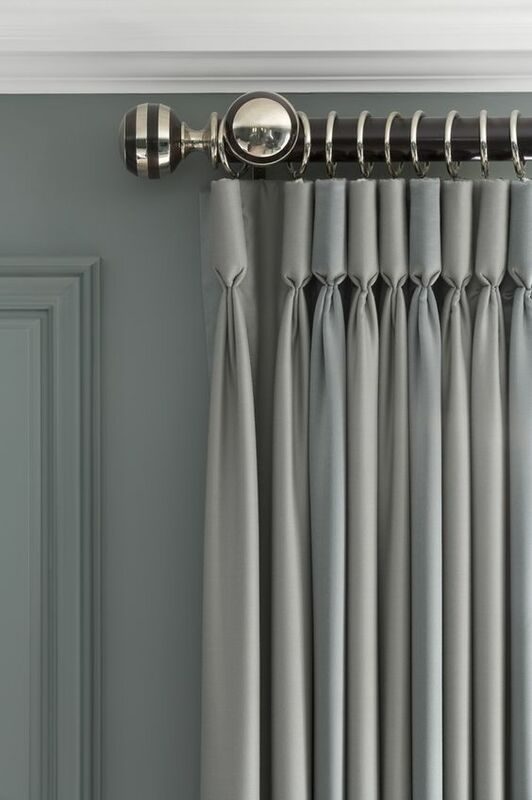 As their name suggest box pleated curtains are actually boxes placed next to each other.They give a very tailored look and drape into deep folds creating a formal pleated look. They are ideal for rooms like lounges,dining or study. The loops of fabric are on the top and can be hung only on the rod.This is the informal style of curtain and can be used for all weights of fabrics as they are hung evenly and have repetitions. They have a folded appearance and are used in bedrooms ,dining rooms etc. Light weight and medium weight fabrics are used.It comprises of silver rings at the header that a rod weaves through. They can hang easily and therefore they are ideal for kids bedroom.If a more formal fabric is used the eyelet curtain serve the best option for bedroom or lounge. The top of goblet pleat curtains represents a wine glass.They are ideal for grand spaces i.e the spaces with high ceiling. They should be shaped with interlining or wadding.They are used in bedrooms,hotel rooms,lounges,Drawing room etc. They can be used alone or in the combination with a fabric for a cozier look.They are also known as Roman Curtains. They are a good option when you are looking for light control and privacy.They can be used in offices,formal and non formal spaces as per requirement. They are similar to pinch pleat but the difference is that the pleat starts from the top of the fabric and falls from there itself. It works well with substantial fabrics,light weight fabrics will definitely need lining to look good.They can be used in drawing room, lounges,offices etc. They are one of the best option when it comes to set an adequate amount of natural light.The Sheer fabrics allows lightness to come in. They are hung as secondary curtains or over blinds.They often have a tab top design and can be customized in any style.They are suitable for almost every room. They can be formal when the curtain top is enclosed in a pelmet,concealing the curtain rod or wall joinery. Pelmets are decorative framework used to conceal curtain fixtures at the top of window casing. They are usually made out of wood,Flat and box like in shape.They can be shaped to add decorative details.Valances are softer in appearance with gathered or pleated heading. They are used in bedrooms,drawing room ,Restaurants,lounge etc.